On 28 January 1963 Sylvia Plath was hard at work. On that day she completed her "Landscape on Childhood" (later titled "Ocean 1212-W"). She may have also recently completed "Snow Blitz" and was hard at work on poems. She revised the ending of "Sheep in Fog" first composed about eight weeks earlier, and then wrote "The Munich Mannequins", "Totem", and "Child". Did you know that "Child" was once featured at a "Poems on the Underground" in London? The program started in 1986. In addition to being readable on the Tube, once upon a time, posters were sold for these, too. Recently the Lilly Library has been awarded a $10.9 million grant and part of these funds, given by the Lilly Endowment, will go towards renovating the library. The Library has created a special web page that will provide news and updates on the renovation. This will have an affect on researchers going to look at the Sylvia Plath collection. And, because they do actually hold more stuff than Plath materials, it will also affect those collections, too. Chances are if you have plans to visit the library this spring and summer you will be fine and not experience and delays or disruptions. But visitors later in the year and toward the end will definitely want to double-check their plans and thus plan accordingly. 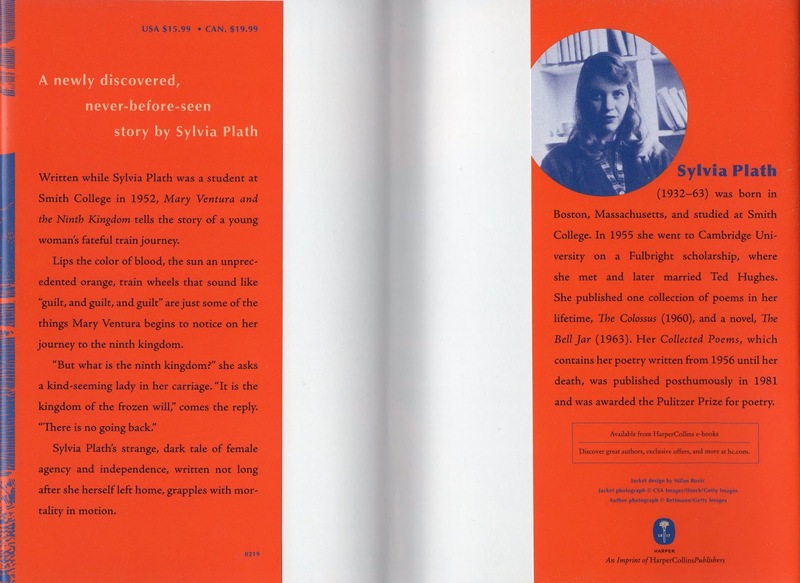 Smith College is also in the midst of a several-year renovation project affecting their Sylvia Plath papers, too. (I presume they have non-Plath holdings, too, but let's be honest, they hardly matter.) 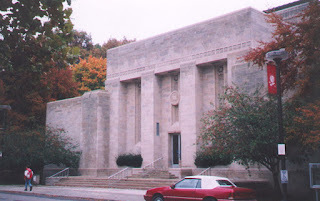 Normally housed in the Neilson Library, their special collections are temporarily in the Young Library. Writing this now I realized that I have not been to Smith College since January 2017, before the Neilson closed, and now that I have moved away, I may never go back. Weird. All links accessed 11 April 2019. 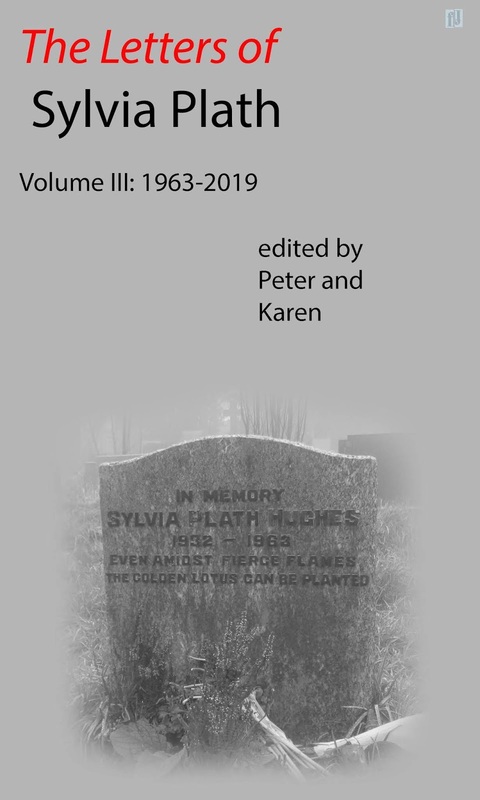 David Trinidad's phenomenal essay "On the Road with Sylvia and Ted: Plath and Hughes's 1959 Trip Across America" was one of the best pieces I had to pleasure to read and work on when I was co-editor of Plath Profiles. And it in part led me to start thinking about Sylvia Plath picture postcards. I got to see, as part of the Letters of Sylvia Plath project, as many postcards as was possible. And so now that her texts are available, I thought I might write a post that might become a series which looks at the picture side of the postcards Plath sent. 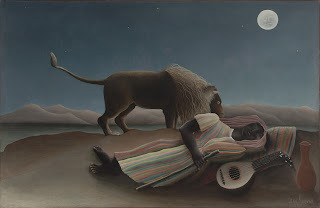 The idea came to me in June 2012, the year after publishing David's essay, when I did a little research into the postcard Plath sent to J. Mallory Wober circa 17 November 1955 of Henri Rousseau's The Sleeping Gypsy. The letter is printed in Letters of Sylvia Plath, Volume 1, pp 1011-12. The original painting is held by the Museum of Modern Art in New York City. Plath visited the MoMA several times on various visits to New York City and during the autumn and winter of 1954-1955 made trips to the city with Richard Sassoon. The painting was exhibited from 19 October 1954 to 23 January 1955 as part of the "XXVth Anniversary Exhibitions: Paintings". According to her pocket calendar, Plath visited the Museum of Modern Art on 24 January 1955, the day after the exhibit closed! It could be that she purchased the postcard at that time. But she also visited in June 1953 and April 1954, and it is possible the painting was on general view. All links accessed 2 June 2012 and 10 January 2019. The following letter was sent from Sylvia Plath to me via David Trinidad's Ouija board early this morning. It will be included in the paperback edition of The Letters of Sylvia Plath, Volume 3: 1963-2019. This CEASE AND DESIST ORDER is to inform you that your persistent actions including but not limited to transcribing and annotating my letters; tweeting, blogging, websiting and otherwise attempting to represent me on the Internet (not for nothing, the wifi is awesome up here) have become unbearable. You are ORDERED TO STOP such activities immediately as they are being done in violation of the law. I have the right to remain free from these activities as they constitute [harassment/stalking/etc. ], and I will pursue any legal and spirituous remedies available to me against you if these activities continue. These remedies include but are not limited to: contacting law enforcement to obtain criminal sanctions against you, and suing you civilly for damages I have incurred as a result of your actions. Again, you must IMMEDIATELY STOP these activities and send me written confirmation that you will stop such activities. You risk incurring some very severe legal and Godly consequences if you fail to comply with this demand. This letter acts as your final warning to discontinue this unwanted conduct before I pursue legal actions against you. At this time, I am not contacting the authorities or filing civil suit against you, as I hope we can resolve this matter without authoritative involvement. I am not under any circumstances, however, waiving any legal rights I have presently, or future legal remedies against you by sending you this letter. I might smite you. This order acts as ONE FINAL CHANCE for you to cease your illegal activities before I exercise my rights. I, Peter K. Steinberg, do hereby agree to stop these unwanted activities which are in violation of Sylvia Plath's rights. I understand that this is my final chance to cease these activities. I understand that Sylvia Plath potentially has the right to pursue legal and smiting action against me relating to my engagement in these activities, but she will not pursue those rights in contemplation of my compliance with this written demand. I further understand that Sylvia Plath has not waived her rights and may pursue legal remedies against me if I fail to abide by this agreement. I understand that this agreement is not specifically limited to the activities named herein. I will not engage in any activity now or in the future done for the purpose of stalking/harassing Sylvia Plath. I furthermore agree not to engage in any activity, regardless of its official title, that is done in violation of Sylvia Plath’s legal rights. If I fail to cease performing these activities, Sylvia Plath may pursue legal action against me in accordance her legal rights. This agreement acts as a contract between Peter K. Steinberg and Sylvia Plath. Forbearing enforcement of legally enforceable remedies is sufficient consideration to support this agreement. This agreement represents the entire agreement between the parties. Any statements made orally, written, or otherwise which are not contained herein shall have no impact on either parties’ rights or obligations elaborated in this agreement. Emily Van Duyne (Twitter)—whose work on Sylvia Plath you should know (LitHub, Electric Lit, The Smart Set, LitHub again, and LitHub again as well as a forthcoming review of The Letters of Sylvia Plath, Volume 2 in the Harvard Review and a monograph-in-progress on Plath entitled Loving Sylvia Plath)—invited me to give a talk on Sylvia Plath and the Letters at her university, Stockton University, in Galloway, New Jersey and it was an offer I could not refuse. So, this is a blog post to inform and invite anyone who is in the area to attend the talk which is open to the public. On that Monday before the talk I will be sitting on on two of Emily's classes to talk Plath. She is teaching the Beuscher letters and The Silent Woman as part of a comparative study. That afternoon, as well, I will sit in on a psychology class taught by Kaite Yang. On Tuesday, I look forward to sitting in on her colleague Thomas Kinsella's class. Funding for this opportunity was provided by a 2020 Learning Grant, as well as the American Studies and Literature programs at Stockton. All links accessed 28 February 2019. Last evening was the a wonderful WSJPlus/HarperCollins event on Sylvia Plath's recently published short story Mary Ventura and the Ninth Kingdom at the showroom of MM.LaFleur on 42nd Street at Bryant Park. Manhattan is always a whirlwind experience--a hullabaloo, as Plath said. It was a terrifically Plathian day all around, receiving interesting emails from people and also getting the proofs of the paperback editions of both volumes of The Letters of Sylvia Plath. When it rains, it Plaths. My thanks to Carla Zanoni for asking me to participate and for being a wonderful host and conversationalist. The room was full of people and I enjoyed the rapport, the questions and chatting, and in particular just seeing and reading the genuine interest in peoples faces. Here is a clip of Carla reading from the story. My thanks, too, to Carl Rollyson for coming. It was awesome to chat with a familiar face before the gig started and was wonderfully calming. Look for the next blog post on Monday...another event! 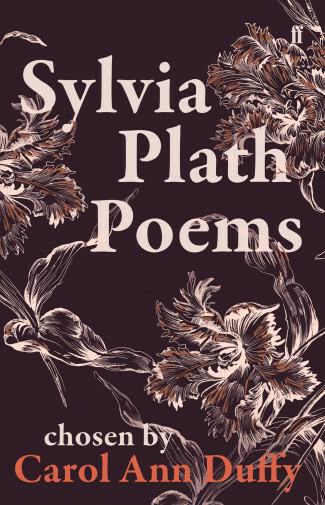 Faber and Faber has reissued Sylvia Plath Poems Chosen by Carol Ann Duffy today. The book is 160 pages, the ISBN is 978-0-571-34851-0 and it retails for £9.99. Copies are available, as you might imagine, from the publisher as well as from sites like Amazon.co.uk. All links accessed 6 March 2018. 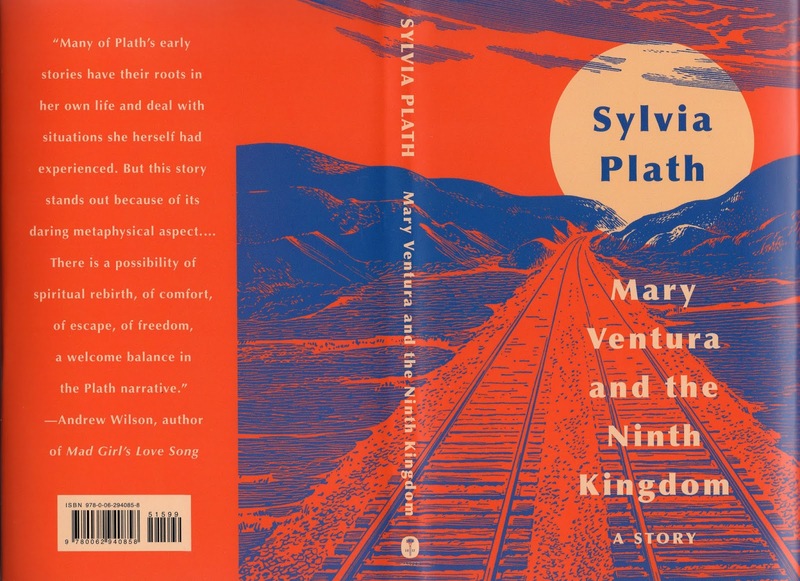 In the United States, today marks the publication day of HarperCollins' hardback edition of Sylvia Plath's short story Mary Ventura and the Ninth Kingdom. Upon publication of the paperback in January, Parul Sehgal wrote in the New York Times: "[Plath's] story is stirring, in sneaky, unexpected ways…Look carefully and there's a new angle here — on how, and why, we read Plath today." The list price is $15.99. The ISBN is: 978-0-06-294085-8. The front of the jacket features the same image as the paperback and the back of the book quotes the estimable Andrew Wilson from when news of the story's publication broken in October 2018. The book itself is in a beautiful blue cloth with gold spine lettering. Copies are available from HarperCollins (preferred), as well as via Amazon.com. Event reminder: If you are a Wall Street Journal+ member, you can register to attend an event next Tuesday, 12 March, in Manhattan. All links accessed: 28 February and 3 and 5 March 2019. On Tuesday 12 March 2019, I will be joining Carla Zanoni, an editor at the Wall Street Journal, at an event discussing Sylvia Plath's short story "Mary Ventura and the Ninth Kingdom", recently published by HarperCollins. We'll be discussing other Plathian things and themes, too. The event will be at the MM.LaFleur Bryant Park Showroom located at 130 W 42nd Street on the 13th Floor. It starts at 6 with registration and reception. The discussion and Q & A starts at 6:30 and a networking reception starts at 7:30. This is a neat opportunity and I am grateful to Carla Zanoni, Amber Burton, and Alix Milne for organizing the event as asking me to be there. I am terrifically excited to participate in this event. All links accessed 16 and 28 February 2019. Now that we are a full month plus into 2019, here is a look at what books are scheduled to be published this year by or about Sylvia Plath. 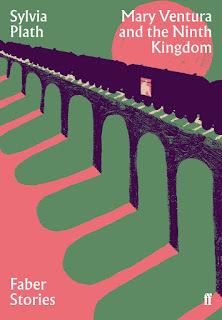 The first translation of Mary Ventura and the Ninth Kingdom, into French, will be published in May. 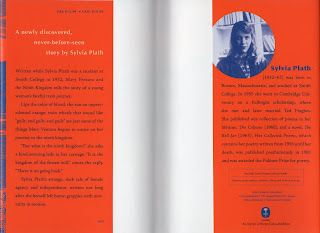 I am still under the belief that Sylvia Plath in Context, a book of essays edited by Tracy Brain, will be published by Cambridge University Press this year and will post more information on that as soon as possible. All links accessed 3 February 2019 via Amazon.com and Amazon.co.uk. 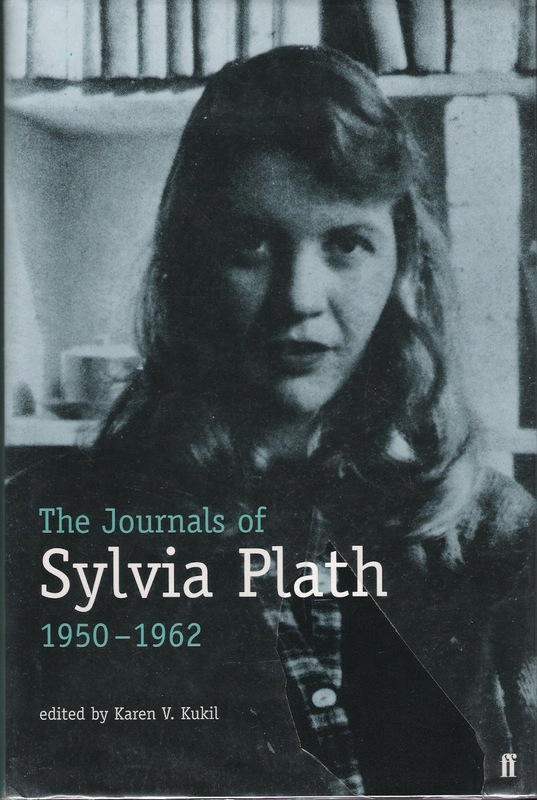 Back on 15 April 2014, I did a blog post on "Dating Sylvia Plath's Journals". The point of it was to show how the Letters of Sylvia Plath, in conjunction with additional archival resources--Plath's and otherwise--could be used to date undated entries in Plath's journals. Now that both volumes are published and I had a bit more time on my hands, I revisited Plath's published Journals to see how many more entries could be dated exactly, approximately, or just not at all. There is not much to criticize about the published Journals, but I have always wished there were supplied dates for undated entries. Using a variety of resources, including Plath's letters, wall and pocket calendars, and other archival resources, I have gone through the book and assigned exact and circa dates for the undated entries. I hope that you find this useful. And, please let me know if I am incorrect with any of these, or if you have information which can help more accurately date an entry or date one I did not. The structure below is the journal entry number, the page number from the 2000 Faber/Anchor edition on which the entry begins, and then the supplied dates. Journal entries where no date could be established are not included here; but they will be added in the event information can lead to doing so. In the newspaper, the dead lock over a Korean armistice is still going on; a widow Tabor's letter about saving face and squeezing out more than a stalemate of the Chinese forces is getting a big play; Anglo-Iranian crisis is still rampant; senate voting a cut in foreign aid . . (bad sign?) 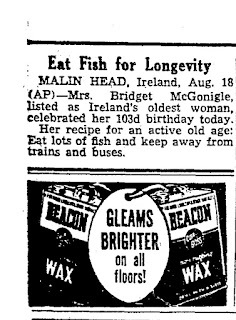 and on page 14 Mrs. MacGonigle, age 103, tells how to live to a ripe maturity: "Eat lots of fish and keep away from busses and trains." As Plath was in Swampscott, I figured she was reading The Boston Globe. 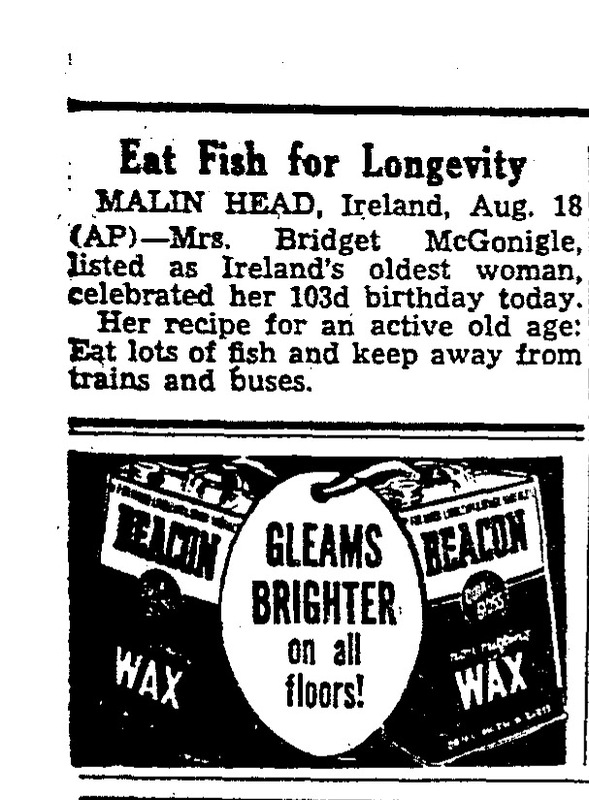 So I went to their online archive and found the story on Mrs. McGonigle which was published on 19 August 1951. Back when the Journals were being prepared this would have been required using microfilm, but still the information was then available. There were a couple of articles on the Korean situation. As Plath was in the C-Section of the paper, a possible article mentioning the armistice is "Reds Threaten Air Attacks If Truce Talks Fail" on C1. This may also be the second article Plath refers to about the stalemate and saving face... I found nothing in the paper by or about a 'widow Tabor'. "Counter Offer by Iran Keeps Oil Talks Alive" (page C65). "More Foreign Aid Cuts by Senate Units Seen" (page C1). 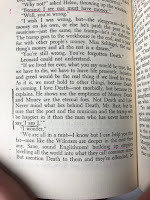 Beginning with journal entry number 122, still in the 1950-1953 journal, and continuing through the end of her available journals, Plath more regularly, more religiously, dated her journal entries. So there are fewer in the below table that were undated by Plath. The following are for the Appendices. I flit between half-wishing and full-on wishing that they would have been inserted into the main body of the text so that there would not be the need to flip back and forth. In fact, the necessity of doing that for the endnotes, alone, in the Journals encouraged me to press for footnotes rather than endnotes in the Letters so that all relevant information would be on the immediate page(s). This appendix is largely dated. However the initial entries for many of the dossier-like impressions on Plath's North Tawton acquaintances are not. Plath's 1962 Royal Letts calendar has 'NT Notebook' listed on two days: 12 and 14 February 1962. The entry for 14 February also indicates Plath wrote in her 'DIARY'. O! To have that diary... So it is clear from the Letts and from her journal entries on the Tyrers, Winifred Davies, Mrs. Hamilton, the Webbs, and the Keys that she was getting into the swing of her surveillance at this time. Several North Tawtonians and other Devonians then came onto the scene such as the entries for the Watkins', Nancy Axworthy, Mr Ellis, Charlie Pollard, and the Billyealds are all fully dated. Mr Ellis, from 4 July, is the last dated entry in the 'journal' as clearly the disruption in the marriage several days later likely prevented Plath from maintaining her pace and contacts with her neighbors. A lot of episodes recorded in this Appendix can be dated using a variety of sources. I wish Plath had written up her visits with Elizabeth Sigmund and David Compton. All links accessed 30 September 2018. 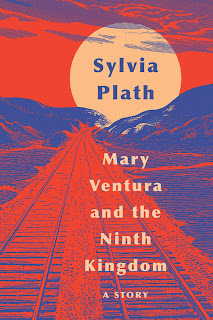 Though it has been available for a week or so in the United Kingdom, today is the official publication day of the Faber & Faber edition of Sylvia Plath's Mary Ventura and the Ninth Kingdom. It is a small format paperback of 40 pages. The ISBN is 978-0-571-35173-2 and copies are reasonably priced at £3.50. The book is for sale via the link above to Faber's website, as well as from Amazon.co.uk, Waterstones, and other booksellers. 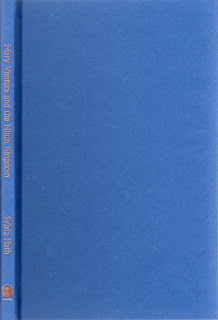 If you are interested about Mary Ventura, please make sure to look at Plath's Journals, The Letters of Sylvia Plath, Volume 1, and my blog post: "Sylvia Plath's Mary Ventura". All links accessed 2 January 2019. 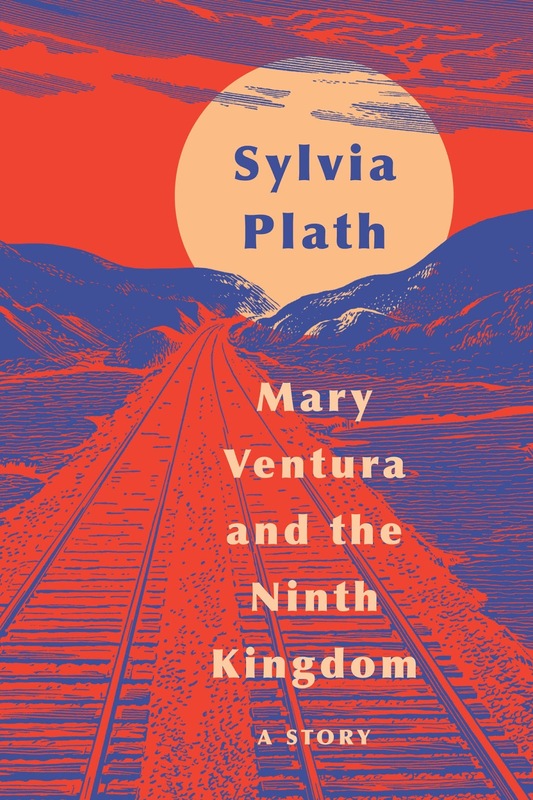 With the imminent publication of Sylvia Plath's short story "Mary Ventura and the Ninth Kingdom", her readers may wonder about the name "Mary Ventura". 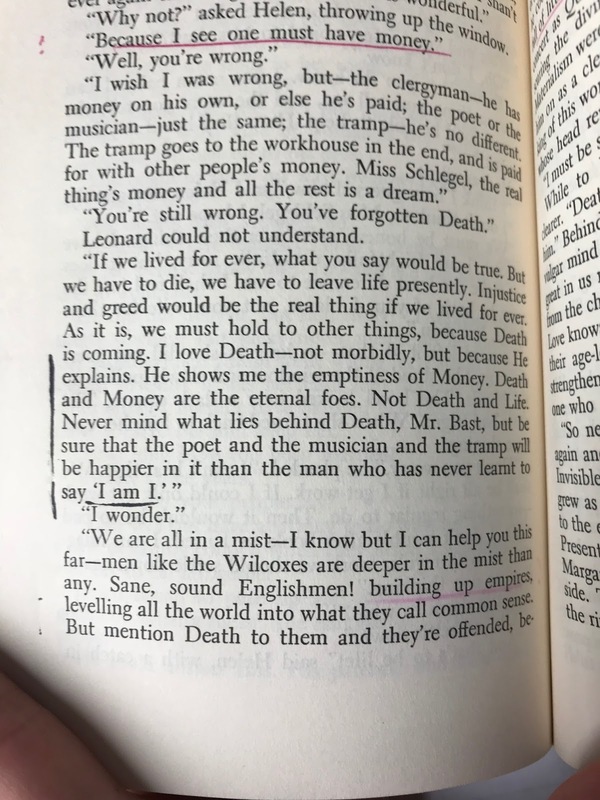 Any reader of her diaries, journals, and letters will recognize it as that of a girl with whom Plath attended Wellesley public schools. Here is the real Mary Ventura's story. 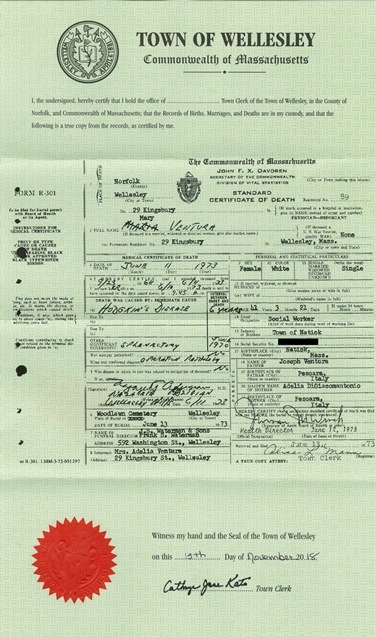 Mary Ventura was born Maria Domenica Ventura in Natick, Massachusetts, on 21 February 1932, daughter of Italian immigrants Joseph (1901-1977) and Adelia Di Giacomantonio (1910-1994) Ventura. 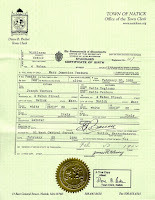 According to information recorded in the 1930 Census, Joseph and Adelia married around 1925; he was 24 and she was 15. Joseph's occupation was listed as Gardener and in the Industry of "Odd jobs". Delia was not employed and the couple resided at 4 Waban Street, Natick. Sometime between 1932 and the mid 1940s, the Ventura family moved to Wellesley, the next town over. It was at Junior High School where Plath and Mary Ventura met each other. The Venturas lived at 357 Linden Street, which backs onto the main train line between Boston, Worcester, and beyond. Mary had literary aspirations. She was published a few times in the Wellesley town newspaper, The Townsman, authoring three reports: "Junior High Briefs" on 16 January 1947 (p.11) and two "High School Highlights" on 29 September 1949 (p. 4) and 10 November 1949 (p. 7). 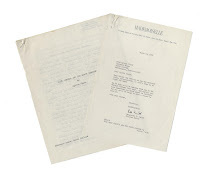 In May 1948 Plath and Ventura co-wrote a radio play called "The Island"; a typescript copy with holograph corrections is held by the Lilly Library. At some point in 1950, Mary wrote a beautiful 34 line poem entitled "sylvia". Composed of one four-line stanza and six five-lined stanzas, the poem shows Mary meditating on Plath, with most first lines in each stanza beginning "i think of her…". Mary's last published article that I could find was a letter to the editor which appeared on 27 January 1972 in the Townsman. In the autumn of 1949, in her senior year at Bradford (later Wellesley) High School, Mary Ventura and her family moved back to Natick. The Townsman reported on 24 November 1949 that her English class held a "Mary Ventura Day" in which the class, at Mary's request, listened to Bach recordings. Plath noted Mary's absence in her High School scrapbook (p. 25). And she appears several times in Plath's early diaries, as well as in her published Journals. Mary graduated from Natick High School in 1950. Though she was in the class of 1950, circumstances in her life lead to a delay in matriculating into college, graduating from Boston University in 1958. Mary Ventura married her Natick High School sweetheart John P Detore, Jr. (1933-2008) in December 1952 at St. Paul's Church, Wellesley. 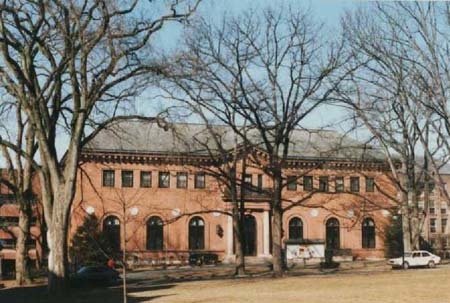 By this time the Venturas had moved back to Wellesley and were living at 440 Washington Street, which faces the railroad tracks, in Wellesley Hills. At the time of her wedding, Mary was taking evening courses at Boston University and Detore was at Northeastern. After a honeymoon in Vermont, the Detores settled in Natick. However, by 1954 and 1955 Mary Ventura appeared as Mary V Detore in the Boston City Directory as a typist in Boston at the YMCA. Yet in both directories, her home is listed as the old 440 Washington Street in Wellesley which we can deduce indicates that her marriage was short-lived. By March 1955, Mary was taking courses at the Newton Junior College, having worked for the previous few years. By October 1957, she was again just Mary Ventura. She was elected to the executive board of the Student Christian Association at Boston University. She was at this time a senior at BU in the college of Liberal Arts majoring in American Literature and History. Mary was awarded a Bachelor of Arts from Boston University at their summer commencement in 1958. 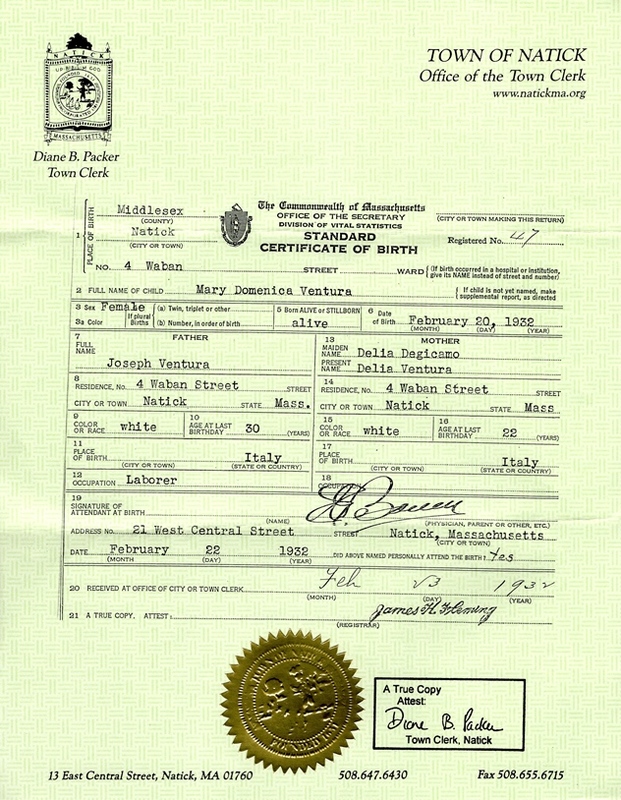 In 1961, there is an immigration card for a "Maria D. Ventura", with "our" Mary's exact birthday and birthplace, recording that she arrived in NYC on the SS Independence from Naples, Italy, and which lists her home as Malden, Mass. Between 1958 and her death in 1973, little is known about Mary Ventura. At the time of her death, Ventura was listed as a social worker in Natick who had lived in Wellesley for 36 years. She died at her home, 29 Kingsbury Street, Wellesley, at the age of 41, where she was living with her parents. In her Townsman obituary, it is listed that she died "after a long illness." 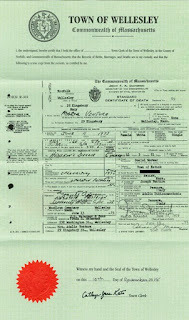 Her death certificate lists the cause of death as Hodgkin's Disease. Mary was buried at Woodlawn Cemetery with a lovely headstone engraved with "Till we meet again". She was joined by her parents five and twenty-two years later, respectively. I visited the cemetery in Wellesley on a below-freezing morning in November 2018 to find the final resting place of Mary Ventura and her parents. 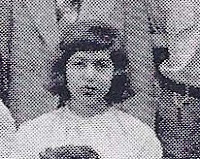 Sylvia Plath used Mary Ventura as a character and name in two stories written for courses at Smith College in her second and third years. Her "Mary Ventura", written for English 220a "Practice in Various Forms of Writing", is probably an exercise in the genre of nonfiction as other pieces written just before seem also to fall into this category. While a very crude summary… in "Mary Ventura", Mary and the narrator meet for lunch after a chance encounter. Mary works at Filene's, and the narrator has been away at college. They discuss their once close but now divergent lives after the passing of a year. In the story Mary admits to having an affair with a married man, and likes to watch trains go by her house with the narrator, hoping one day to be on one and ride it "to the end of the earth." A typescript, dated 14 December 1951, is held by the Lilly Library. 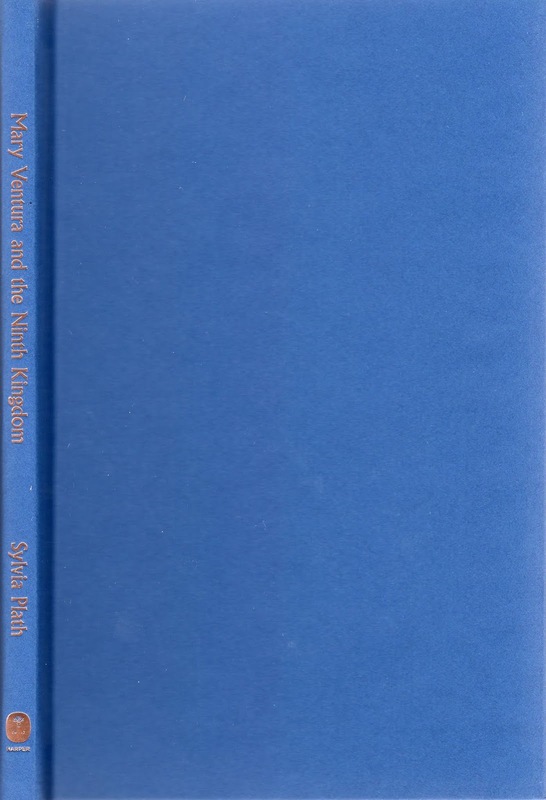 The following year, Plath wrote a story called "Mary Ventura and the Ninth Kingdom" for English 347a "Style and Form". That typescript, also held by the Lilly, is dated 12 December 1952. In January 1953, Plath revised the story and asked her mother to retype it and submit it immediately to Mademoiselle (see Letters of Sylvia Plath, Volume 1, p. 553). 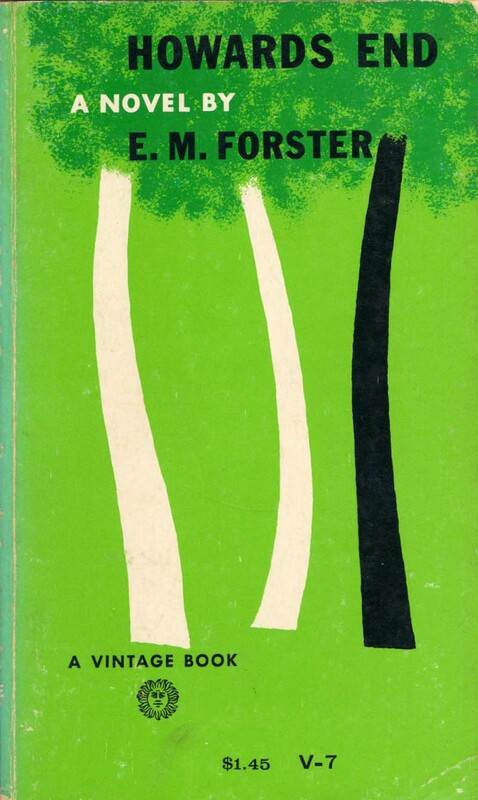 Mademoiselle rejected the story in March 1953 and it is this copy of "Mary Ventura and the Ninth Kingdom"—the only known existing copy of the story in this form—that Faber and Faber is printing in their Faber 90 series (press release), commemorating the 90th anniversary of the firm. Plath later revised the story in December 1954, changing the title to "Marcia Ventura and the Ninth Kingdom" and considered submitting it to the Christophers contest, ultimately selecting a different story for the competition. Mary Ventura and the Ninth Kingdom will be published in the UK by Faber on 3 January 2019 and by HarperCollins in the USA on 15 January 2019. Excerpts appeared in the 29 December 2018 issues of The Guardian (UK) and Wall Street Journal (US). All links accessed 16 November 2018 and 1 January 2019.